Hi! friends, today I am posting something different on my website which you might not expected. Usually I post lyrics of Bollywood (Hindi) movie , Punjabi movie, non movie songs but today I will tell you about Online Text Case Changer that I had developed to make your and mine work easy and fast. 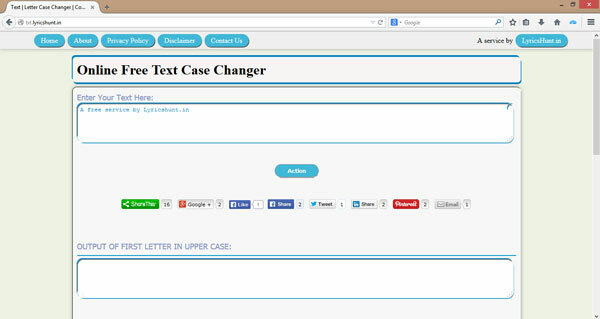 Using this tool you can change case of your text in just one click. I had uploaded this tool on txt.LyricsHunt.in . Text used for sample: This is a Sample Text. Sample text: This Is A Sample Text. It is similar to above except that it does not ignore any letter and converts the whole text into upper case just in one click. If any letter that is already in upper case will remain in upper case. As the name suggest, it will convert whole text into lower case. If any letter that is already in lower case will remain in lower case. It is the most interesting one, as it reverses the case of text. This means that if a letter is in lower case will be converted to upper case and if it is in upper case it will be converted to lower case. This is what I like the most, it is perfect for tweeting on twitter, posting something on facebook, or on whatsapp, hike, line etc. It makes your text looks fancy and interesting. It converts the letter in upper and lower case alternatively. This means one letter in upper case, then next one in lower case and then again upper case and so on. Step 1: Go to txt.lyricshunt.in . Write or paste the desired text in text box given there. Step 2: Click on "Action" button. Step 3: Copy the desired case of text from the text boxes given below with result. Report an issue: As this tool is in initial stage so it might have an bug. If you found any, please report it to us using this Contact Us form. Suggestions are also welcomed. This will help us to improve this tool. Note: This text case changer is provided free to use by any one for commercial and non commercial purpose. However you cannot copy the script written behind it by using any method.